dorsaVi Professional Suite monitors and measures quality of movement with a view to improving performance and assisting rehabilitation. The system consists of small and easy-to-use sensors attached to users, and a user-friendly software application. The low price point means performance trainers, physical therapists and chiropractors can readily access lab quality data to inform the treatment of their clients. Using dorsaVi has been like switching the lights on, and it’s my clients who benefit, whether they are elite runners, weekend warriors, or park runners, said Shane Benzie, running technique coach and movement specialist and founder of Running Reborn. dorsaVi’s latest generation of clinical movement technology dorsaVi Professional Suite is now available in the United States, with early adopters such as physical therapists, performance trainers and running training specialists pre-ordering the ground-breaking technology. dorsaVi Professional Suite monitors and measures quality of movement with a view to improving performance and assisting rehabilitation. The system consists of small and easy-to-use sensors attached to users, and a user-friendly software application. The low price point of $1,490 for the hardware, and an ongoing fee for the software license ($149 to $249 monthly) means performance trainers, physical therapists and chiropractors can use the technology to treat patients. dorsaVi is a leader in movement analysis and developed the ViMove and ViPerform technology currently used by many leading physical therapists and professional sporting teams globally. dorsaVi (ASX: DVL) today announced the commercial launch of the revolutionary movement analysis product dorsaVi Professional Suite in the United States, with the first set of pre-orders shipping today. 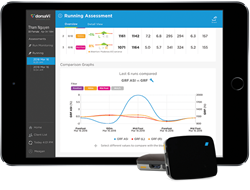 The launch of dorsaVi Professional Suite has been embraced by running specialists and physical therapists, as they now have access to the latest generation dorsaVi technology which is simple to use, mobile and cost effective. dorsaVi Professional Suite consists of small and easy-to-use sensors which monitor and measure quality of movement, and combined with its simplified software interface and lower entry sale price, allows a broad range of customers to assess a range of running, lower limb and low back movement metrics with clinical accuracy. The low price point of $1,490 for the hardware, and an ongoing fee for the software license ($149 to $249 monthly) means this powerful technology is available to a broad range of health professionals, strength & conditioning trainers, and running coaches. “Using dorsaVi has been like switching the lights on, and it’s my clients who benefit, whether they are elite runners, weekend warriors, or park runners,” said Shane Benzie, running technique coach and movement specialist and founder of Running Reborn. dorsaVi (ASX: DVL) is an Australian-listed company focused on developing innovative motion analysis device technologies for use in elite sports, workplace health and safety and clinical applications. dorsaVi believes its wearable sensor technology enables – for the first time – many aspects of detailed human movement and position to be accurately captured, quantified, and assessed outside a biomechanics lab, in both real-time and real situations for up to 24 hours. Clinical: dorsaVi is transforming the management of patients by providing objective assessment, monitoring outside the clinic and immediate biofeedback. dorsaVi is currently used by medical and physiotherapy practices globally. Elite Sports: ViPerform is allowing coaches and medical teams managing elite athletes and teams to screen athletes and provide objective evidence for decisions on return to play, measure biomechanics and provide immediate biofeedback out on the field, tailor and track training programs and optimize technique and peak performance. ViPerform is being used in the US by the National Basketball Association (NBA), the Major Soccer League (MLS) and the National Football League (NFL), by the AFL and NRL clubs, Cricket Australia, and the Australian Institute of Sport (AIS) in Australia, and by Barclays Premier League (EPL) clubs, England and Wales Cricket Board and the Board of Control for Cricket in India as well as various Olympic teams and athletes internationally. Workplace: dorsaVi enables employers to assess risk of injury for employees as well as test the effectiveness of proposed changes to workplace design, equipment or methods based on objective evidence. dorsaVi has been used by major corporations including Sodexo, London Underground, Vinci Construction, Crown Resorts, Caterpillar (US), Monash Health, Coles, Woolworths, Toll, Toyota, Orora (formerly Amcor), Crown and BHP Billiton.